Taxes are bad, on that we can agree. So not paying taxes must be good, right? Wrong. 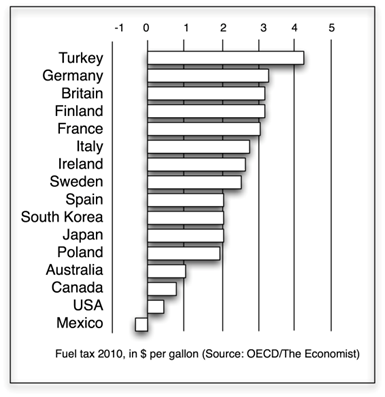 A reform to cut taxes for everybody might be a good idea (or not). But having millions of individuals cheat to reduce their own taxes is never a good idea. 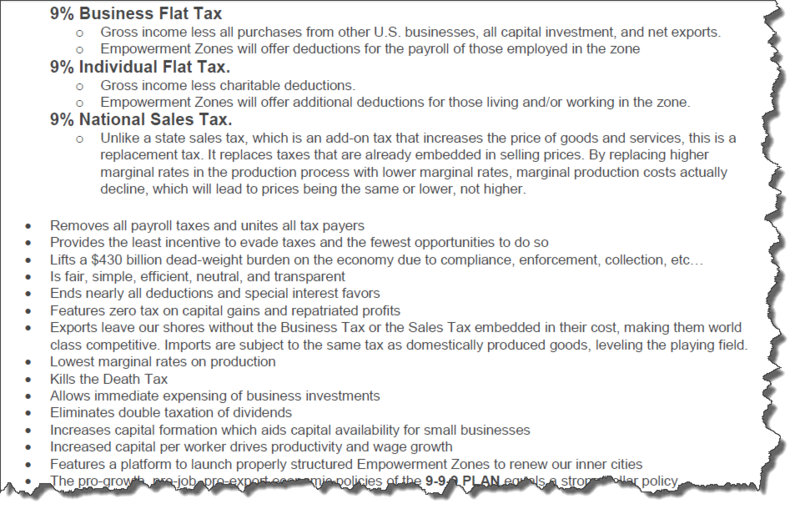 It is a tax cut without reason, without fairness, and without the incentive or cost advantages of a cut in tax rates. Just to focus on that last point, note that some people have to go to a lot of trouble to re-arrange their affairs to be able to cheat on their taxes, and they have to take on extra risk to do so – the risk of getting caught. So their net “advantage” from cheating is much less than their dollars of tax savings. That cost of tax cheating does not apply to the case where Congress and the President agree to cut taxes for everybody, because then all those dollars stay in the private sector instead of being wasted. The IRS has just released new numbers on the “tax gap” in the United States, the amount of U.S. tax liability that goes unpaid. 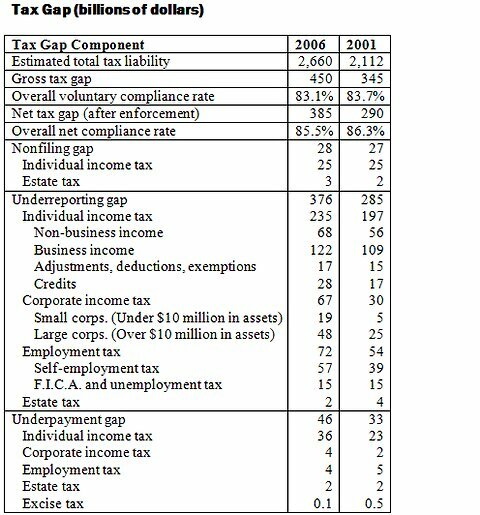 From 2001 to 2006, as you can see in the table below, the tax gap increased from $290 billion to $385 billion. Just to reverse the increase in unpaid tax would gain the much-discussed and much-needed $100 billion revenue per year, or $1 trillion over ten years. The percent of tax voluntarily paid has fallen from 83.7% to 83.1%. After expected small amounts are recovered by our meager enforcement efforts, the “overall net compliance rate” has fallen from 86.3% to 85.5%. The average taxpayer cheats on about 15% of their tax liability, but almost nobody is “average.” Rather, the huge majority of Americans earn wages and salaries that are reported by their employers to the IRS, on which tax withholding is paid by the employer to the IRS. Workers cannot cheat on that income, and so the huge majority of Americans pay all of their tax due. The cheating is highly concentrated among other Americans, especially those who are self-employed and get paid in cash that is never even reported to the IRS. In fact, the IRS estimates that noncompliance or misreporting is 1% of wages and salaries, but a huge 56% of proprietor income! This issue is covered nicely in the blog by Bruce Bartlett, who also points out that “The number of IRS employees fell to 84,711 in 2010 from 116,673 in 1992 despite an increase in the population of the United States of 53 million over that period.” Fewer auditors chase large numbers of tax cheaters, so of course compliance falls. When I worked at the U.S. Treasury Department, in the Office of Tax Analysis, I used to hear about revenue/cost ratios of ten to one! That is, one additional dollar spent on enforcement could generate an additional ten dollars of revenue. And the problem has only gotten worse since then. We don’t want a huge number of IRS enforcement agents to strike fear into the hearts of average law-abiding Americans who do pay their taxes on time. But a lot of us might feel better about our country if a few more IRS agents struck some fear into the hearts of those who are supposed to pay their taxes and don’t! And those cheaters don’t have to bear extra cost of getting caught, if they just paid taxes instead of cheating. 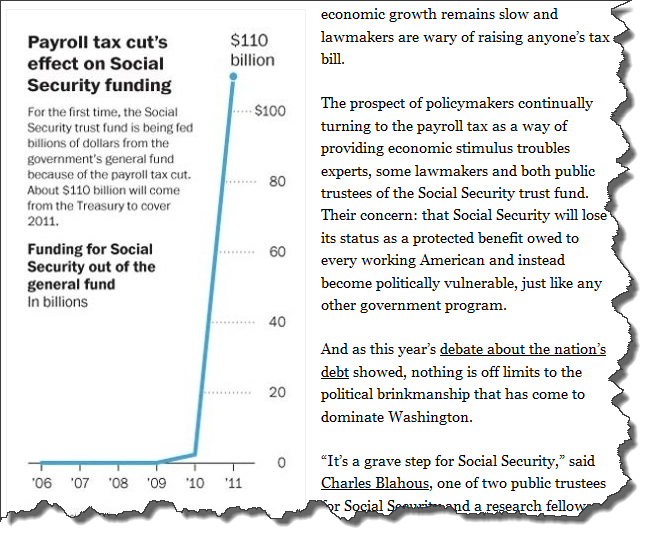 Here is an interesting article, in the Washington Post, entitled “Payroll tax cut raises worries about Social Security’s future funding“. It points out that the recent payroll tax cuts are intended for short term stimulus, but they muck with the way that social security benefits are funded. Instead of coming frm payroll taxes, that money now will haveto come from general revenue. Nothing is Wrong with a “Do-Nothing” Congress! The Budget Control Act of 2011 established a joint congressional committee (the “Super Committee”) and charged it with the responsibility of reducing the deficit by $1.2 trillion over 10 years. If the Super Committee fails to reach an agreement, automatic cuts of $1.2 trillion over 10 years are triggered, starting in January 2013. These are said to be “across the board”, but they are not. They would apply $600 billion to Defense, and $600 to other spending. Entitlements are exempt, including the Supplemental Nutrition Assistance Program (SNAP, formerly food stamps) and refundable tax credits such as the Earned Income Tax Credit and child tax credit. These entitlements are exempt from the cuts because anyone who qualifies can participate (that spending is determined by participation, not by Congress). In addition, the Bush-era tax cuts are set to expire at the end of 2012, so doing nothing means that tax rates would jump back to pre-2001 levels. That combination might be the best thing yet for our huge budget deficit. The Federal government’s annual deficit has been more than $1 trillion since 2009. Continuation of that excess spending might create a debt crisis similar than the one now in Europe. The Center on Budget and Policy Priorities estimates that the trigger would cut $54.7 billion annually in both defense and non-defense spending from 2013 through 2021. Meanwhile, U.S. defense spending is around $700 billion per year, with cuts of about $35 billion per year already enacted, so the automatic trigger would reduce defense spending from about $665 billion to about $610 billion. Some may view that 10% cut as draconian, but the simple fact is that the U.S. needs to wind down its spending on two wars. Congress and voters are fooling themselves if they think the U.S. can continue to spend the same level on defense, not raise taxes, and make any major dent in the huge annual deficit. The same point can be made for automatic cuts in Social Security, which in its current form is unsustainable. Since it was enacted in 1935, life expectancy has increased dramatically, which means more payouts than anticipated. Birth rates have declined, which means fewer workers and less payroll tax than anticipated. The system will run out of money in 2037. Congress either needs to raise taxes or cut spending. But they won’t do either! The only solution might be the automatic course, without action by Congress! 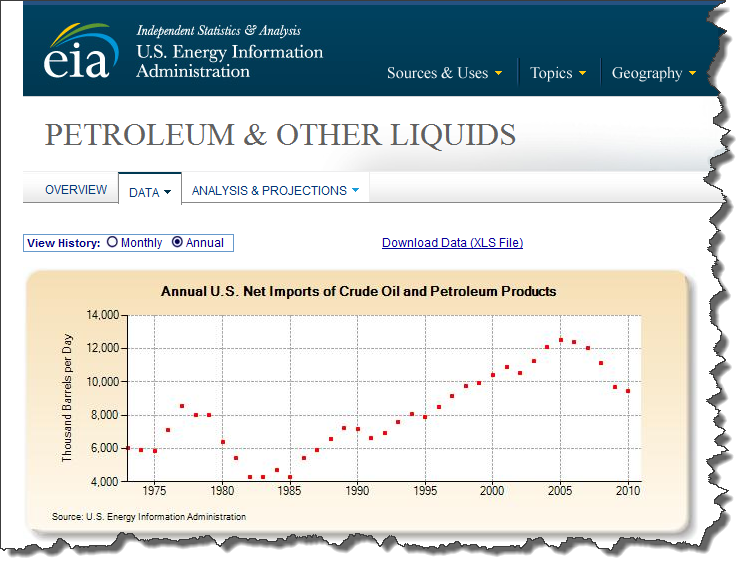 For further reading, see “Why doing nothing yields $7.1 trillion in deficit cuts”.